A cool new smartphone app could play a huge role in helping lost dogs find their way home again. 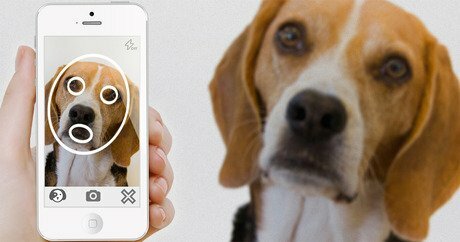 The app, called Positive Identification of Pet — or PiP for short — uses advanced facial recognition technology similar to that used in the identification of people. “If we can do this for humans, certainly we can PiP app founder Philip Rooyakkers tells TODAY.com. To use the app, pet owners simply register their pet’s information and then store a clear photo in the PiP database. Should a pet go missing, the owner can send out an alert through the app, which notifies animal shelters and veterinarians within a 15-mile radius to be on the lookout — like an amber alert system for companion animals. PiP will also scour social media outlets for found pet postings. On the other end, should someone find a missing pet, they can simply upload a photograph of the dog’s or cat’s face and PiP will analyze the photo to see if it matches any of the profiles stored in its database. Rooyakkers says he first came up with the idea behind PiP back in 2011 after his own dog, a Yorkshire Terrier, went missing. Luckily Rooyakkers found his four-legged friend, but the whole experience left him shaken. Then, a short time later, Rooyakkers was working at his Vancouver doggie daycare business when a couple of owners were signing in their new black Labrador Retriever. The experience stuck with Rooyakkers long after that day. Thinking about what little time the dog’s original owners had to find their missing dogs broke his heart. “He was in the shelter for less than 48 hours, but because he had no microchip, no tag, no tattoo, he was unidentifiable. They had to adopt him out,” he remembers. Rooyakkers knew there had to be a better way. That’s when he started looking into facial recognition technologies to determine whether or not they could prove useful in identifying the faces of dogs and cats. According to the Daily Mail, PiP’s founder finally settled on the technology developed by expert Dr. Daesik Jang. PiP was first lauched in January, and already the revolutionary app is exciting pet owners and the animal rescue world alike. Because the technology is relatively new, some animal rescuers are a bit skeptical, like Alexandra Heule of the Kansas City Pet Project. But Rooyakkers claims PiP is capable of recognizing 98 percent of dogs and cats run through their system — some amazing statistics. And the app is already helping pet owners locate their missing pets. “The more we can reunite families with their pets, the better it is all around,” Rooyakkers says. Want to try PiP for yourself? The app is free to download, but does come with an $18.99 annual subscription fee. PiP is currently available through iTunes and Google Play, and Rooyakkers says his company should be ready to launch an Android version of PiP soon.